Adversity has a great impact on people. Tough times and difficult problems can be opportunities that build self-esteem, persistence and character. 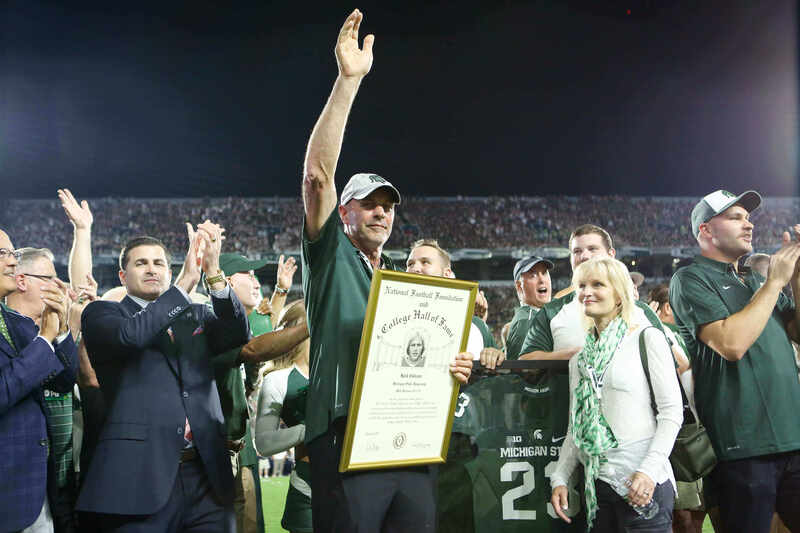 Kirk Gibson and his Michigan State teammates were faced with adversity after their freshmen in East Lansing, when the Spartan football program was put on NCAA probation for the remainder of their collegiate careers. Gibson was a wide receiver from Waterford, Michigan, who received honorable mention all-state notice in high school. He joined 24 other freshman on MSU’s 1975 team, and he became the sole freshman to become a first-year starter. While he only caught nine passes that fall, he scored four times and averaged close to 30 yards per catch. The probation went into effect the start of Gibson’s sophomore season. Darryl Rodgers became the new coach and would have the task of building a team in an NCAA-mandated atmosphere with no bowl games and no televised games for the next three seasons. Of that group of 25 recruited players in 1975, Gibson and 14 of his fellow freshman teammates stayed and went on to become champions as seniors. While Kirk had a breakout season catching 39 passes for seven touchdowns and an impressive 19 yards per catch average, the effect of the probation was immediate as the Spartans had a 4-6-1 record in 1976. The following year, a tie against Indiana was the only thing that kept MSU from sharing in the Big Ten title. A strong 1977 season led to a greatly anticipated 1978 season. In the year’s first contest against Purdue, Sparty opened strongly with two touchdowns including Gibson catching a scoring toss. But quarterback Steve Smith was injured with a broken hand early in the contest and would miss nearly the entire game. MSU would not score again that day in a 21-14 loss. After three weeks State was 1-3 as they faced 5th ranked Michigan. A decided underdog, the defense intercepted three Wolverine passes, while a perfectly balanced offense (248 yard rushing and 248 yards passing) combined for the highest total offense mark ever attained by a team against a Bo Schembechler led Michigan squad. The win broke an eight game losing streak to their in-state rivals. From that point on, the Spartan offense began to click. The next six weeks saw point totals of 49, 55, 59, 33, 52 and 42 as MSU won its final seven games as they ended the season as the nation’s 12th ranked team. Stat wise, Sparty was third in the nation in scoring, third in total offense and seventh in passing. With a 7-1 Big Ten record and a win over co-champion Michigan, the Spartans would have had a New Year’s Day appointment in the Rose Bowl had it not been for the probation.